මේ දවස්වල බ්ලොග් ලියන්නත් වෙලාවක් තිබ්බෙ නෑ. තිබුණ වෙලාවෙ අර අන්ලොක් කරන එක හැදුව. ඒකෙ අන්ලොක් කෝඩ් එක හදන්නෙ සදීප අයියගෙ බ්ලොග් එකේ තියන bb5.at අඩවියෙන්. මේකෙන් අන්ලොක් කරන එක‍ ලේසි කරල තියෙන්නෙ. ඒ කියන්නෙ මොඩම් එකේ ඩ්‍රයිවර්ස් දාල මෘදුකාංගය ගන්න විතරයි තියෙන්නෙ. ඒකෙන් COM පෝර්ට් එක තේරුවහම මෘදුකංගයෙන් IMEI හා මොඩමයේ විස්තර පෙන්වනව. ඉන්පසු GetUnlock Code මගින් කෝඩය ගෙන එම මෘදුකාංගයෙන්ම එම කෝඩ් එක මොඩම් එකට යව අන්ලොක් කරගන්න පුලුවන්. තාම පොඩි පොඩි ලෙඩ ඇති. මම ඊයෙ හැදුවෙ. අද මොඩම් දෙකක් අන්ලොක් කරල බැලුව. අවුලක් තිබ්බොත් කියන්න. මේ.. දැක්කෙත් නෑ හුඟ කාලෙකින්..
නෙක්ස් ඉන්න වෙලාවක් කියපන් කො..
10 times unlock code deela modem eka 4ever lock wunane. dan kohomada lock eka kaddanne?????????? Your commentමගේ HSDPA modemඑක Unlockකර ගන්න අවශ්‍ය වෙලා අන්තර්ජාලය හරහා ඊට විසඳුමක් හොයන විට තමයි මාලින්දගෙ බ්ලොග් එක හම්බ වුණේ. ඇත්තෙන්ම ඉතාම සාර්ථක වැඩක්. තත්පර ගණනක් ඇතුළත HSDPA modemඑක Unlockකර ගන්න පුඑවන් වුණා. මෙයට විසඳුම් ඇතැම් වෙබ් අඩවි වල තිබුණත් ඒවා ඉතාම සංකීර්ණයි. mage eka orange network eken lock wela thiyenne..
oyage program ekenuth eka harigiye na. port eka close ekiyanawa send unlock click kalama.. but port eka hariyata dunne. connect click kalama alredy open kiyalath enawa.. pls hlp…………. magelaga orange sim eka thiyenawa eka dalada unlock karanna ona???? machan ZTE MF 100 dongle eka unlock karanna soft ekak thiyanawanam denawada DC-unlocker ekenuth karanna ba… unlock counters 0 wela thiyenne..
Everytime I insert the vodafone sim in the dongle, and I do the process, an error comes up saying ‘incorrect password’…. ????? OOOPS! The model is E353…. Niyamai,thappara ganakin dongle unlock kara. Great work with this little application. Please update your pictures on the site. No images make a site look un-professional. What is the language been written on this site…? GOOGLE doe’s not recognise it for translation…! Windows 7 වල හොදට වැඩ. ඔය ටූල් එකෙන් 153 Connect කලාම එයා වෙන සොෆ්ට්වෙයා එකක් බාගෙන දායි. when i press Get unlock Code nothing happens..
unlock code button, the code didn’t come out…? I still loking for link where i can download mobile partner from huawei. me how to unlock this dongle. Thanks a lot! I tried this via Huawei Unlock Tool 2.1.0.0! mama make fireware update kara daneka sim ekakwath ganne ne. help pls…. dala baluwa hariyanne dan eka firmware ekakwath ganne…. wrong c version kiyanawa naththan update fail kiyanawa…. hariyane naa yalu! unlocked keyala awa eth unlock naa!mobile partner downlord kala,ethe wena sim ekak damoth keyane “only the spesified sim /usim can be used on this device” puluwan wei da unlock karanna? hariyanaa oyage new version 1.oyata puluwanda E173u-1 unlock karanna eka karanna bainam keyanna!!! malinda mage wrong codes entered wela 10 ma. ath dongle aka wada karanawa.so, mata puluwanda dongle aka unlock karaganna? (Unlock PIN) ..Dialog Box1 Anawane.So What 2 Do ? can i unlock modem E173u-1? Pls help me to check modem with chipset E303Cs-1, the code incorrect and can not force unlock also! I used your software, the message appeared as Unlocked. But i couldn’t use mobitel Sim. your software is working very well I unlock my dongle today and it did not take a minutes. Thank you for malinda also best wish for devolp new programme for Sri Lankan. මචං මාලින්ද, මගේ තියන ඩයලොග් ඩොංගල් එක (E173) මේකෙන් අන්ලොක් වෙන්නෙ නෑ. මම හැම සෙල්ලමක්ම දාල බැලුව පේන හැටියට උන් ඒව වෙන විදියකට ලොක් කරල වගේ. පොඩ්ඩක් හොයල බලපං වෙලාව තිබුනොත්. එනිවේ සොෆ්ට්වෙයා එක නම් එලකිරි! mage laga thiyenawa Etisalat(Dubai) walin gaththa Huawei E353 HSDPA ekak.oyage software eken unlock code eka gaththa.eth wada unlock wenne naha.10 times try kala.dan permanent block una.unlock kara ganna widiyak thiyeda? macho mage e173 voice enable karanna giyama mehema error eka enawane mokada karanne mekata? System.InvalidOperationException: An error occurred creating the form. See Exception.InnerException for details. The error is: Could not load file or assembly ‘Microsoft.VisualBasic.PowerPacks.Vs, Version=10.0.0.0, Culture=neutral, PublicKeyToken=b03f5f7f11d50a3a’ or one of its dependencies. The system cannot find the file specified. —> System.IO.FileNotFoundException: Could not load file or assembly ‘Microsoft.VisualBasic.PowerPacks.Vs, Version=10.0.0.0, Culture=neutral, PublicKeyToken=b03f5f7f11d50a3a’ or one of its dependencies. The system cannot find the file specified. To enable assembly bind failure logging, set the registry value [HKLMSoftwareMicrosoftFusion!EnableLog] (DWORD) to 1. To turn this feature off, remove the registry value [HKLMSoftwareMicrosoftFusion!EnableLog]. 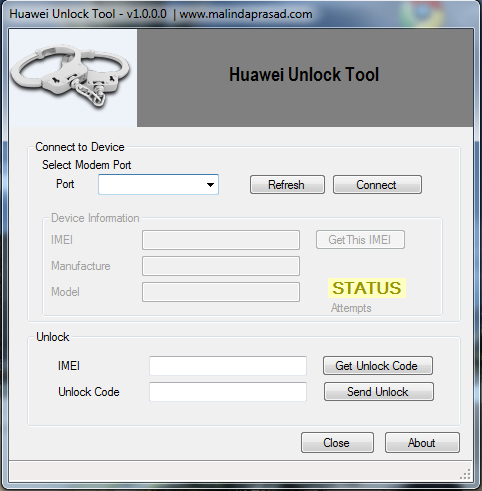 i’am using huawei e303d idea nettsetter, when i try to unlock it(with idea sim) with ur tool(HUAWEI UNLOCKER TOOL v2.4.3.0) it always show unlocked, then i insert another operator sim it shows not unlocked. also i try to unlock it with other operator sim the status shows “KNOWN attempts remains: 0″ what i do? reply me immediately plzzzzzzzzzzzz…..
plzz i want to use it with other SIM’s…..
code 56954050 eka thama hama unlock tool ekakinma enne. Hello Malinda, I try to unlock my device with many tools but, all me get the code is 59435372 but when I try to put the code, Error code Any idea? mama ada ude oyata saudia idala kathakaparu yaluwek. I tried this for several times.But it didn’t work.An error message was displayed saying Device Status Known.Help and more function not supporting.Can u pls help me.. I have Huawei E1731 & want to unlock it. I have also tried your software but when i click reset counter button nothing happens. I have also tried AT commands but no success yet. what it 3 & last 0. Hope to get a solution soon. “Device status known” & nothing happens. But unlock code eka dunnama weda karanne ne…. attemps remaining eka aduwenawa… kohamada unlock karaganne??? pls..
Por favor una nueva versión del programa para desbloquear el HUAWEI E303. Espero su pronta respuesta.